Convention gospel music and community gospel singing are two variations of an American heritage with direct roots in colonial New England and indirect roots reaching to the Italian Renaissance. Community gospel singing is a folk phenomenon that allows individuals to reenact the process of community through artistic expression by singing religious hymns and reaffirming social bonds through the informal festival of a picnic among neighbors. Gospel music was a major venue for creative folk expression in rural Southern agricultural communities during the late nineteenth and early twentieth centuries. The folk art form was spread by singing masters who toured rural America with evangelistic fervor teaching musical fundamentals to young audiences. Community singing and its more formal cousin, convention gospel music, also constituted the first instance of mass musical participation across geographic and cultural lines in American popular culture and presaged more modern forms of mass musical participation such as country music and rock-and-roll. 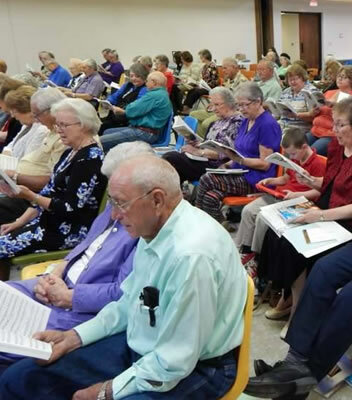 Texas community singers still gather on weekends in towns around the state in a nondenominational setting to sing religious hymns. Singings consist of two types, both of which employ four-part harmony. Each genre is further characterized through the use of shape notes for musical notation. Shape notes are a method of musical notation adapted for sight-singing choral arrangements. They reduce the tones of the scale to specific shapes such as circles, triangles, trapezoids, or squares. Those shapes represent relationships between the root note "do" and the subsequent notes of the melody. As an alternative notation to the usual type, shape notes convey the tonal relationships of sound through shape in addition to positions on lines and spaces. Shape-note music enables singers to move the root note, or key, up or down to fit individual vocal ranges. The seven-shape-note tradition is a nineteenth-century development from the original fasola, or four-note solmization, which was imported from the British Isles and proved popular in colonial America. The four-note systemor fasolacontinues today under the name sacred harp music, which generally uses minor scales, relies on one songbook only, and groups singers by their voice parts. Sacred harp melodies have been traced back 900 years to Medieval Europe, although the lyrics were subsequently changed or updated to reflect religious themes. Sacred harp also relies on a similar set of republished songs and exhibits remarkable continuity over time. Sacred harp is generally confined to the eastern parts of Texas and areas of the South. The second type, hymnody, employing seven shape notes, attracts greater audiences and is popular statewide. It became a dynamic vehicle for gospel songwriters in the late nineteenth century and attracted a growing body of new compositions that demonstrated greater musical sophistication than their fasola cousins. Seven-shape-note songbooks exhibit the musical versatility that appealed to young people at singing schools and were responsible, therefore, for the growing popularity of the tradition. The first Texas community singing using seven shape notes reportedly occurred in December 1879. Itinerant teachers representing the A. J. Showalter Company of Dalton, Georgiaincluding company founder A. J. Showalterventured west to Giddings, Texas, and conducted a rural music school that lasted for several weeks. At least two individuals from that initial school learned enough over the next year to continue as teachers of the seven-note method in Texas and were subsequently employed by the Showalter Company. Though community singings are relatively unstructured, convention gatherings display formal organization. Generally, a convention is a gathering of participants from several communities. Conventions occur on the county, regional, and state levels. In 1936, as community gospel music approached its peak popularity, singers from several southern states gathered at the behest of songbook publishers to stage the first national gospel-singing convention in Birmingham, Alabama. The national convention continues to this day, rotating among various small towns nationwide but usually staged in the South. In Texas, national conventions were staged at Plainview (1968) and Stephenville (1987). A convention president manages the singing in a formal but sensitive manner. Individuals are called from the audience to lead the class or congregation. They choose the song and piano player, and lead the singing. Convention presidents try to allow all who want to lead a singing the opportunity to do so during gatherings, which typically occur on Saturday afternoon and evening and reconvene on Sunday. Convention singing depends on newly-published convention books, which participants purchase to take home. Without the support of songbook publishers, convention singing would not have achieved its widespread popularity. In early conventionsthose taking place about 1900quartets demonstrated the musical ideals of harmonic gospel singing. Within a decade, songbook publishers, beginning with the Vaughan Music Company of Lawrenceburg, Tennessee, asked the better groups to represent their companies. While skillfully demonstrating the music form in its ideal, quartets were good advertising for songbook publishers. The technique of using quartets as advertising was put into widespread use by the StampsBaxter Music and Printing Company in Dallas, which had a dozen quartets on the road in the 1930s. 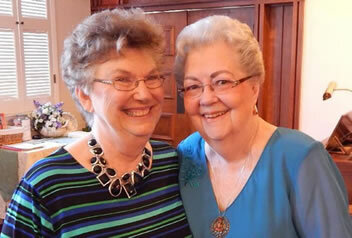 After World War II the Stamps Quartet Music Company was represented by more than thirty-five quartets in the South. In Georgia, Alabama, and Mississippi, some quartets aligned themselves with Texas music companies. Gospel music and the ability to sing it were spread through the rural singing-school tradition, which depended on itinerant music teachers. Singing schools using the seven-shape-note system spread rapidly in Alabama, Georgia, and Virginia after 1900; became common in East Texas during the World War I era; and reached widespread audiences in West Texas as the 1920s came to a close. Local churches hosted annual community singing schools, rotating among denominations, although in West Texas the community itself put up funding for the school, which was usually supplied through an auction of baked goods. A typical ten-day singing school began at 9 A.M. and lasted until 3 or 4 in the afternoon. Teachers reviewed musical rudiments. If an individual worked hard, he could master the scale and direct a song at the end of the two-week session. Meanwhile, there was daily practice from the new convention books that the teacher provided. At the end of the session, the community was invited to hear the class in a recital. One sidelight of a community singing school was that churches developed choirs and the overall level of musical competence improved. The gospel music movement peaked in the mid-twentieth century, largely through the influence of Texas-based musical publishing companies including StampsBaxter and the Stamps Quartet Music Company, both headquartered in Dallas. Robert Henry Coleman, longtime song director at the First Baptist Church of Dallas, became one of the worlds largest publishers of hymnals during the first half of the twentieth century. Producing more than thirty songbooks, he distributed copies all over the world. His music editor, Baylus McKinney, composed many songs that were published in Colemans hymnals. In Coleman, Texas, gospel performer, singing-school teacher, and publisher Robert Sterling Arnold founded the National Music Company in 1937 and served as owner and operator until his death in 2003. He published annual shape-note convention songbooks and composed more than 400 songs himself. Other prominent twentieth-century songbook publishers included Vaughan Music Company in Lawrenceburg, Tennessee, and the Tennessee Music and Printing Company in Cleveland, Tennessee. Quartets like J. D. Sumner and the Blackwoods became so successful financially that they purchased the Stamps Quartet Music Company. Similarly the Blackwoods and the Statesmen purchased the James D. Vaughan Music Company in 1964. The publishing end of the companies declined rapidly after the purchase, and rights to the Vaughan Company were sold subsequently to the Church of God. Similarly, Zondervan, a religious publishing company in Michigan, purchased the StampsBaxter Music and Printing Company and eventually moved the operation to Michigan. Radio was also a major factor in the spread of gospel music. One feature of the 1936 Texas Centennial celebration in Dallas was a series of radio studios in hexagonal glass booths at the fair grounds. Rural folk were fascinated. They had heard radio broadcasts but had never seen one. StampsBaxter quartets performed several live broadcasts at the State Fair of Texas. KRLD in Dallas, impressed with the reception, decided to try a noonday program in the fall of 1936. V. O. Stamps entreated listeners to write in if they liked the music. Within a week KRLD was deluged with mail. The KRLD broadcasts, sponsored by American Beauty Flour, became noontime staples in Texas. Eventually, live gospel singing expanded into the morning hours at 6:45 A.M. and occupied a 10 P.M. evening slot. At noon during the summertime, it was possible to walk down any street in Texas within broadcast range of KRLD and hear the Stamps Quartet singing. By 1938 the StampsBaxter singing normals in Dallas became so popular that V. O. Stamps hosted an All Night Singing at the end of the three-week class session in June. KRLD carried the first broadcast, which was held in the Cotton Bowl. At midnight FCC limitations were lifted. KRLD turned up the wattage, and the broadcast went international. Soon, V. O. Stamps and his quartets were traveling to Del Rio and providing wire recordings to radio station XERA for international broadcast. The mid-1930s saw the rise of a highly popular gospel quartet with the Carter Quartet on WBAP radio in Fort Worth. Composed of Dave Dad Carter, his wife Carrie, and daughters Rosa and Effie (renamed Rose and Anna), the Carters were raised in the singing-school tradition and sang a variety of songs on the air, but their gospel numbers soon caught on as audience favorites. The quartet became known as the Chuck Wagon Gang (a name selected by sponsor Bewley Mills) and soon devoted its popular radio broadcasts exclusively to gospel tunes. The group became successful Columbia recording artistsone of the few white gospel groups in the nation to secure a major record label in the years before World War II. Remarkably, the quartet remained with Columbia until 1977. Drawing largely from shape-note songbooks published by Stamps-Baxter, they were instrumental in bringing those songs to a large listening audience, and the Chuck Wagon Gang was the first to record, for example, the favorite Ill Fly Away in 1948. The group also stood out as an early gospel quartet that featured guitar rather than piano as the prominent instrument. Their appeal crossed over to country music radio stations as well. The Singing Wills Family, originally from Hall County, Texas, was another popular gospel quartet that emerged during the 1930s. A core lineup eventually consisted of twins Bob and Betty Wills, along with siblings Calvin, Lou, and others. The group went through various personnel changes through the years as various members branched off into other groups, including the Bob Wills Family, The Inspirationals, and the Junior Wills Family. Their popularity secured them their own television program, the Wills Family Inspirational Hour, which became the first full-color gospel syndicated television program in 1965. Versions of the Wills Family as well as the Chuck Wagon Gang continued performing in the early twenty-first century. In the 1950s established country star Stuart Hamblin gave up his hard-drinking lifestyle and dedicated his life to Christ. His decision resulted in a number of successful country gospel songs reflecting his newly-discovered faith. He wrote and recorded the highly successful It Is No Secret (What God Can Do), This Ole House, and others. He hosted his own radio show, The Cowboy Church of the Air in the early 1950s. The latter half of the twentieth century brought great change to the field of gospel music as the genre transitioned from its role as a local social activity to a more commercial medium. As people moved to urban centers after World War II, the singing school declined in popularity. Convention gospel music was primarily a phenomenon of rural America. In this new audience milieu, quartets discovered they no longer needed sponsorship from songbook publishers and achieved popularity on their own as entertainment acts. The Statesmen Quartet, for example, added flourishes such as exuberant singing, arm waving, hand clapping, and electric modification that entertained new audiences. Although this was alien behavior for traditional convention quartets, the new stage business attracted interest. By the end of the twentieth century, the seven-shape-note tradition of gospel singing had become an isolated niche inside the greater market of gospel music. Although a national convention for gospel quartets attracted thousands of devotees and participants from across the United States during the course of a week, the National Singing Convention drew fewer than a thousand for a weekend meeting somewhere in the South. In Texas the black sacred harp singing tradition had virtually disappeared. The trend paralleled musical expression in modern America. Music had evolved from a communal folk activity in which many participated into an art that supported individual musical specialists who reached mass audiences through technological means such as radio, recordings, and the Internet. In the early twenty-first century, convention gospel music and community singings, however, still occurred across the state. Gospel festivals took place in such communities as Rockport, Wimberley, Stephenville, Salado, and McKinney, and the National Quartet Convention held the first American Gospel Music Festival in Dallas in May 2007. The South Texas Gospel Music Association, based in San Antonio, promotes performers and events, while the Texas Gospel Music Museum and Hall of Fame, founded in 1985 and headquartered in Arlington, honors those who have influenced gospel music in Texas. Handbook of Texas Online, Richard J. Mason and Laurie E. Jasinski, "Gospel Music," accessed January 21, 2018, http://www.tshaonline.org/handbook/online/articles/xbg02. Uploaded on June 15, 2010. Modified on December 5, 2015. Published by the Texas State Historical Association.